Star Wars Vs. Star Trek! The Ultimate Geek Battle!! What is the most useful weapon? "C'mon now. It's a freakin lightsaber!" "Even though I love Star Trek, the lightsaber can deflect saber and laser fire, so i'll go with the lightsaber." 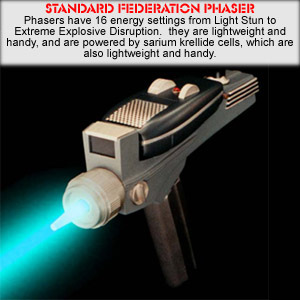 "To win with the saber one must kill, to win with the phaser you can stun and get answers." "You're phaser can't cut through walls, now can they?" 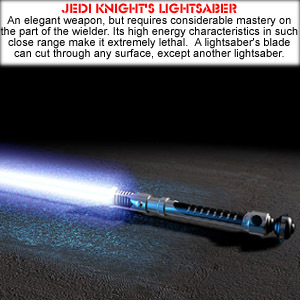 "With a lightsaber you have to be able to use the force to use, yet with a phaser, which has a farther distance then a lightsaber, you only have to be able to know the settings and which end fires :)"
I hold no rights to anything on this website. Any and all images used on this website are the intelectual property of Lucasfilm, 20th Century Fox, Paramount, George Lucas, Gene Roddenberry and his estate, and any and all other trademark holders. This website was created in fun, and no intentional way was it ever meant to slander or defame anything or anyone.